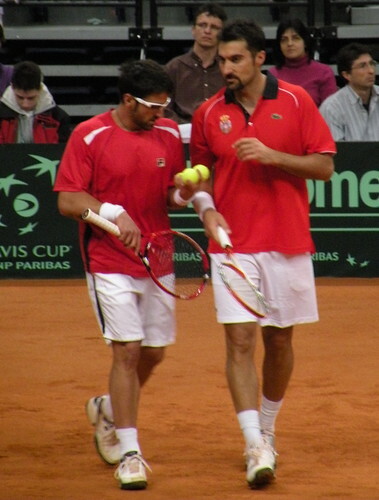 Janko Tipsarevic & Nenad Zimonjic, originally uploaded by bill kralovec. This weekend Serbia is playing the USA in a Davis Cup Tennis round of 16 “tie.” Tie is Davis Cup speak for team match. Nadia and I attended the “rubber” yesterday, which was the middle doubles match of a 5 match series. 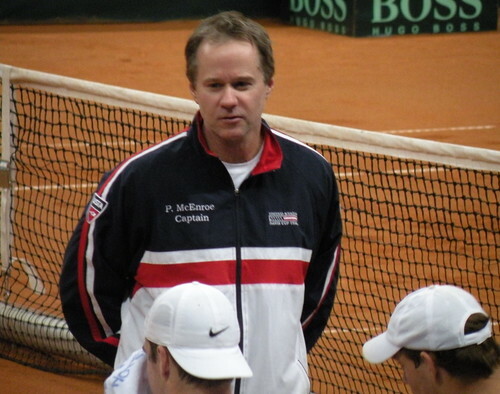 A Davis Cup tie consists of 4 singles matches and 1 doubles, and the country that wins three, wins the tie. We really enjoyed yesterday’s game between the Serbs (shown above) Janko Tipsarevic and Nenad Zimonjic and the USA team of 6’9″ John Isner and Bob Bryan. Nenad is the number one ranked doubles player in the world, but he usually plays with Daniel Nestor, a Serb born in Belgrade but Canadian-raised. Instead of Nestor, who can’t play for Serbia because he represented Canada in Olympic and Davis Cup play, Janko played with him. Tipsarevic is currently ranked #36 in the world and is the third ranked Serbian tennis player behind Novak and Victor Troiki. Isner was playing for the US in place of Bob’s twin brother, who contracted food poisoning. (I wonder where he ate?) Isner looked really good and should be playing more doubles tennis. He is suited for doubles with his powerful serve and quick reactions at the net. His mobility is not a factor in doubles and I hope he takes my advice and plays more doubles. John's brother Patrick gives instructions to his team. The US duo were clearly the stronger team and won in four sets. This gave the US their first win after losing the two singles matches American Sam Querry takes on Victor Troiki (#35 in the world) if necessary. Whoever wins this tie will advance to the quarterfinals to take on Croatia in Croatia. A Serbia – Croatia will be a fascinating match and the first time the two nations have met since the breakup of Yugoslavia in the Davis Cup. The Davis Cup is great and it has created a buzz in Belgrade. 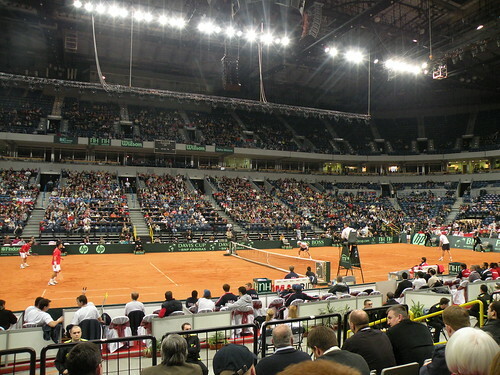 They even made a clay court in the Belgrade Arena to give the hosts an advantage. But what is lacking however, is a world buzz for a world championship event. I propose big changes in the event to make it better. First, I would play the whole tourney in a two week Grand Slam format instead of stretching it over the year. Currently, they play Davis Cup weekends during lulls in the over crowded ATP schedule. It would be like the World Cup of Tennis and the top 8 teams in the world would be invited. You could have a playoff to determine teams if there are several closely rated countries. It could become the fifth Grand Slam on the ATP Tour. The current Davis Cup is to determined by surface and host. Usually, the home nation wins because it has the crowd behind them and they choose the surface that best suits their players. In my Davis World Cup, I would have the surface selected randomly for each rubber, then the teams would have to find their best on a variety of surfaces. To make it even more interesting, lets select the surface AFTER the players have been selected to play. The four surfaces would be clay, grass, two hard court surfaces, perhaps one indoor and one outdoor. It think if they select a good time, it would really take off and be a big event. I think the best players would play and there would be more worldwide fan interest.